Sandwiches are eaten in many countries – either for breakfast, a quick dinner or on the go. In today’s busy world, sandwiches are a convenient and quick fix for a meal. On the vegan market the main products for sandwiches are meat or cheese alternatives. Vegan spreads can become a welcome change to the products available on the market. Spreads can either be based on vegetables or be vegan alternatives to non-vegan spreads like cream cheese, pate or lard. The aim is to get a plant based product that is easily spreadable with the desired texture. The base of these products can either be made using fresh vegetables or in certain cases dried ingredients such as granulates or flour. The big challenge is to get a pleasant product with the desired texture and taste. At KaTech we have the knowledge to get the product you are looking for. Different dairy alternatives can be used for this product. The final product is a creamy, smooth and spreadable alternative to dairy based cream cheese. It can be easily spread on sandwiches or even be used as a filling. Our development for vegan paté is based on pulses. 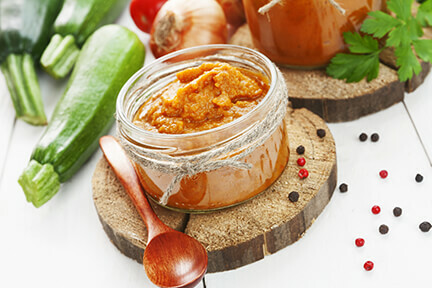 Together with the best functional ingredients a smooth and spreadable product can be achieved. Recipes with a high vegetable content have a high risk of water separation over shelf-life. The right stabiliser system will help to keep the excess water in the product and avoid any kind of texture change over shelf-live. Please use our expertise to develop the vegan product you want. The prices for the main ingredients for vegan products can vary significantly. Cost optimisation in the vegan market means looking at the recipe to exchange certain ingredients and get the right combination to keep the quality of the product at the lowest possible price level. KaTech has a lot of experience in this area and is happy to help. Just get in contact with us.